The Linksys Dual-Band and Tri-Band Wireless-AC routers support two (2) types of frequencies which are the 5 GHz and 2.4 GHz radio bands. The less crowded 5 GHz wireless band offers significantly improved performance over the more common 2.4 GHz wireless band for video streaming or gaming. By connecting to the 5 GHz wireless band of your router, you can maximize the full potential of your Linksys Wireless-AC adapter and benefit from higher data rates. This article will guide you on how to connect to the 5 GHz wireless band of your router. The following steps are ONLY applicable to the Linksys Wireless-AC adapters that support Windows 10. IMPORTANT: If your computer or laptop has a built-in adapter, you need to DISABLE it before using the Linksys Wireless-AC adapter. For instructions on how to disable the wireless adapter of your Windows computer, click here. On your system tray, click on the Wireless icon and select your 5 GHz wireless network name. QUICK TIP: Press the Windows key + D to reveal the Desktop. If you wish to connect to the network automatically upon start-up, check Connect automatically. 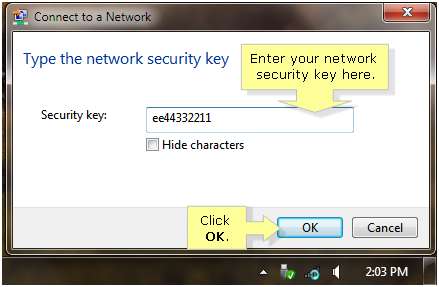 Enter your network security key or passphrase then click Next. Your wireless password is case-sensitive. You will be asked if you want to enable network discovery between the devices in your network. It is recommended to select Yes if you are setting up a home or work network. NOTE: The wireless icon on the system tray will change to , indicating it is now connected to your network with Internet. If there is no Internet connection, the icon displayed will be . The following steps are ONLY applicable to the Linksys Wireless-AC adapters that support Windows 8.1. Click on the Wireless icon on the system tray. The list of available wireless networks will be displayed. 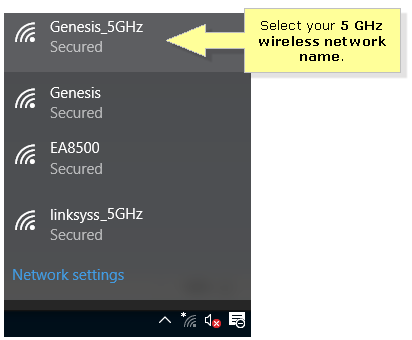 Select your 5 GHz network name from the list and click Connect. QUICK TIP: If you wish to connect to the network automatically upon start-up, check Connect automatically. Enter your network security key or passphrase and click Next. You will be asked if you want to enable sharing between the devices in your network. If you are setting up a home network, select Yes, turn on sharing and connect to devices. When the computer has been successfully connected to the wireless network, it will display the Wireless Connection icon. The following steps are ONLY applicable to the Linksys Wireless-AC adapters that support Windows 7. Click on the Wireless icon. Select your 5 GHz wireless network name from the list and click Connect. 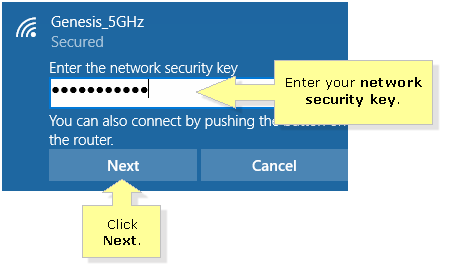 On the Connect to a Network window, enter your network security key or passphrase and click OK.